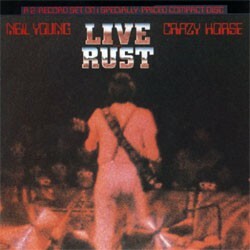 Live Rust is a live album recorded in late 1978 from concerts on the Rust Newer Sleeps tour. It was released in 1979, originally as a double album. It was produced by David Briggs and Tim Mulligan. The Rust Newer Sleep concerts were special and spectacular. On the stage, two huge amps and one microphone of non proportional dimensions were built. Between the sets, strange little people were seen running around on stage fixing the equipment. The music starts with a Neil Young raise up on one of the amps and starts playing solo with his guitar (later on he would be joined by Crazy Horse). In the book Waging Heavy Peace Neil tells the story about this special stage arrangement he came up with. The concert followed the model of Rust Never Sleep album with a mix of acoustic and electric songs. The songs together with Crazy Horse were very loud, as if the huge model amps were really alive. The birth of punk rock hadn’t passed without Neil's notice and “Sedan Delivery” is maybe the closest he ever came to punk rock music. But the biggest influence of the big guitar noise was Jimi Hendrix, at least if we believe the biography Shakey, and we probably should.